It is a man’s duty to find the best violin, if his pursuit is a violin. Violins, violas, cellos, guitar, basses – all equally different and similar in level of goodness, these instruments have been used throughout the ages, and their sonic productions continue to pave a path of inspiration for musicians and artists. Violins, particularly, have been essential components in the history of the art, and they are magnificent tools for precision practice and critical thinking. The swift mind and touch they require, the accurate coordination they call for, and the amount of competition that they conjure drive even advanced users to pains about the path that they chose. Playing the instrument is no easy task, and an interested fellow should be aware of the draining consequences of going “all-in” with the practice. From the 17th century to now, the violin has been cherished as a medium for virtuosity and as a channel for passion, blissful feeling, and paradise-reminiscing emotions. It has been used for the greatest pieces ever composed, and has been experienced in religious circumstances, festive occasions, party environments, and official settings. The art of crafting the violin is one sought after by few and mastered by less – those who succeed in the skill are highly renowned, and earn the respect of musical and visual artists alike. Making a durable, resonant, and clean violin is a trial indeed, and to sell one for a decent price is a feat worth being hurrahed for. Large, world-famous companies occupy the market with their fine, expensive instruments, admired by professionals and serious learners, while cheaper, generic brands control sales to beginners, and have a hand in creating instruments that are suitable for young players. Low prices and decent quality mark the latter, and teachers often recommend starting by purchasing an instrument by one of these sellers. They are commonly used in youth orchestra settings, school rooms, and students’ practice rooms, and should not be frowned upon if used in a circumstance meant for young leaners. A product by the Crescent company will herein be examined. Crescent is known for its inexpensive instruments, and is seen as a good source for beginner violins. The brand’s offers contain accessories beyond the violin itself, including strings, a case, tuner, and others. 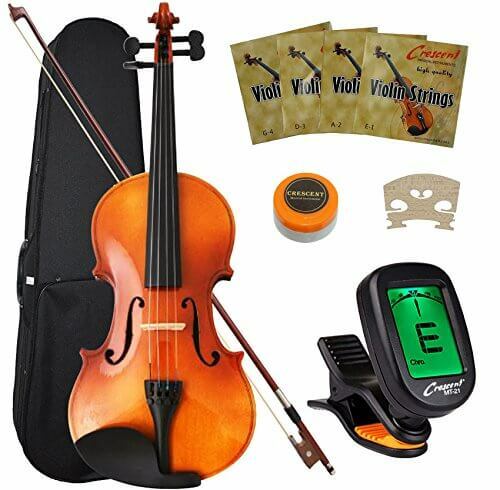 Incredibly affordable, the violins are solid year-long investments for determining if the instrument is right for the learner in question. They allow for precise finger placement, and provide taros with an excellent way to build knowledge. The Crescent VL-NR-PW is particularly appropriate for this purpose, as its outfit holds all the necessary items for the start of a novice’s journey, and as its build (i.e., the way it is designed) serves well as a hands-on tool for advancement in musical capability. The instrument is fun to learn on, and should provide the same satisfaction to users as any violin of the same price does. Long-lasting for their cost, they can serve a diligent student for about a year and a half – after this period, a progressive will likely want to move on to something more apt for an artistic setting. The VL-NR-PW is a neat arrangement of wood and metal. Its interior projects sound well, and its exterior is a pretty thing for eyes to rest on. The instrument’s maple back and sides, combined with its spruce top, adhere perfectly to today’s industry standards, and would appeal to many a traditional maker’s regulations. The sun-tanned, bright-brown-to-dark-orange hue of its surface is lovely upon sight, and fits well amongst an orchestra of the stringed instruments. A maestro will likely have no problem with the visual aspects of the equipment. Black tuning pegs, a fingerboard, a tailpiece, and a chin rest are placed on the violin, fitting in line with today’s top instruments, and carrying the builds of violins from years ago. The violin’s design is classic, and leaves no part unwell. The authentic wood gives the instrument an organic, natural look and aesthetic, and combines classical elements with modern glossing techniques – the body is sheened with a clean finish that functions as a protector and attention-grabber. Four black fine tuners line the tailpiece, allowing for precise pitch correction, while contrasting sublimely with the overall color. A light-beige bridge looks just like ones use by the pros, and is positioned to allow for as voluminous a sound as possible. The bridge is tailored to make replacing strings a hassle-free job, and leaves space for adjustments. The sound of this violin is thin and bright, and is perfect for such pieces as Viotti’s 23rd violin concerto and Mozart’s numerous violin works. Though it does not have the fullness meant for Beethoven or Tchaikovsky’s compositions, it can sustain a solo performance of minor pieces, any day. Its sound functions wonderfully in orchestral settings, and blends with many a string ensemble. Teachers will be pleased by the unimpeded nature of the violin, and will find that the sonic element of the instrument is familiar, leaving no room for mutations in sound. Conductors will be well pleased by the violin’s audition-ready voice, and are sure to accept an appropriate player bearing this instrument. As mentioned earlier, the VL-NR-PW outfit comes with a case, rosin, strings, an extra bridge, and a tuner. These useful assets are excellent for first buyers, as they are proper for any player, advanced or just beginning. The tuner, especially, is uniquely inserted; though it is important, it does not come with many violin packages. It is an attachable one, and, hence, prevents exterior noise from affecting it, allowing users to tune even in crowded, noisy venues. The extra bridge, too, is a significant benefit, as it offers violinists a nice substitute for a delicate piece of equipment. Rosin is necessary for all good bowing technique, and the handy accessory can last for a solid amount of time – six months to a year, perhaps. Orange in color, users will be pleased by the inclusion’s thorough makeup. Crescent’s VL-NR-PW is appropriate for a beginner, and can last for about a year in the hands of a regularly-practicing student. The violin is a fine thing to look at, and works well, visually, in a group musical environment. It is excellent for beginners, and offers a nice tool to work with for a relatively brief time. Its build and body conform to the regulations and “rules” of today, while its functionality is applicable in tons of situations. Its outfit is loaded with practical items. Though it is not suitable for professional musicians or graduate students, it retains glory in the hands of beginners. Its resonance, though not of the elements called for by Beethoven or Brahms, is enough for the purpose of a youth orchestra. Buyers will not regret purchasing this tool, as it can stand the tests of any beginner student or teacher. As it offers more items than other companies’ packages do, it is a step above its competitors, and should attract even picky customers.